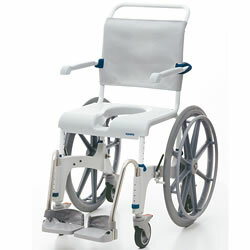 Stainless steel self propelled adjustable shower commode chair with 24" rear wheels. 290 lb weight capacity. 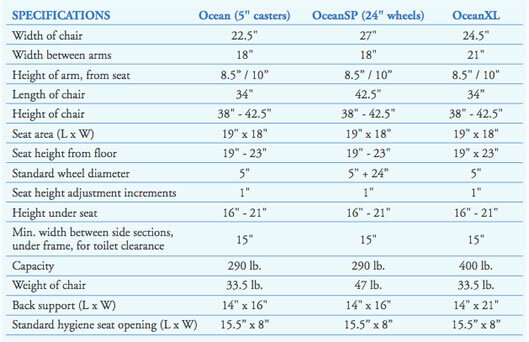 The Aquatec Ocean SP is a height-adjustable shower commode chair. Ocean SP comes standard with 24" self-propelled wheels and push rims. Height adjustment is easily done with push clips in 1" increments for a total of 5 of extra height. Available Accessories: Padded Chest Strap, Padded Lap Belt, Safety Harness, Calf Strap, Soft Seat Overlay, Action Gel Seat, Splash Guard, Solid Insert, Side Laterals, Arm Support Pads, Safety Support Bar, Soft Seat Overlay, XL Back Support Retrofit, Arm Rest Locks, Amputee Support, Calf Support, see below. Components: The Ocean SP is constructed from stainless steel for maintenance-free, rust-free use. The seat frame has a static ten-degree back tilt for comfort. The back upholstery is adjustable. Seat area, 19.5" x 18"
Distance between floor and seat frame, 16"-21"